Do your students want to compete in teams? You can check out this lesson plan and contact Poetry In Voice to see if a Team Regional event is planned in your area. Each student finds, memorizes, and practices their recitation of one poem selected from our English anthology or our French anthology. Be sure they use the "Grade level" switcher so they choose poems eligible for either the Junior Competition or the Senior Competition. Students recite for the class and their recitations are evaluated using our Scoring Rubric, Evaluation Sheet, and Accuracy Score Sheet. The student with the highest score is named your classroom champion. If there’s a tie, refer to our Rules to break it. Ask your colleagues if they’ve also named a champion or champions in their classrooms. If so, you can prepare for the school contest. If only one classroom champion is named and no school contest is to be held,* you can now prep that student for the Junior Online Finals or the Senior Online Qualifiers (formerly known as the Online Semifinals). We hope that you’ll encourage your classroom champion to move on to the school contest and beyond; however, you and your students may decide to end your involvement with Poetry In Voice here. 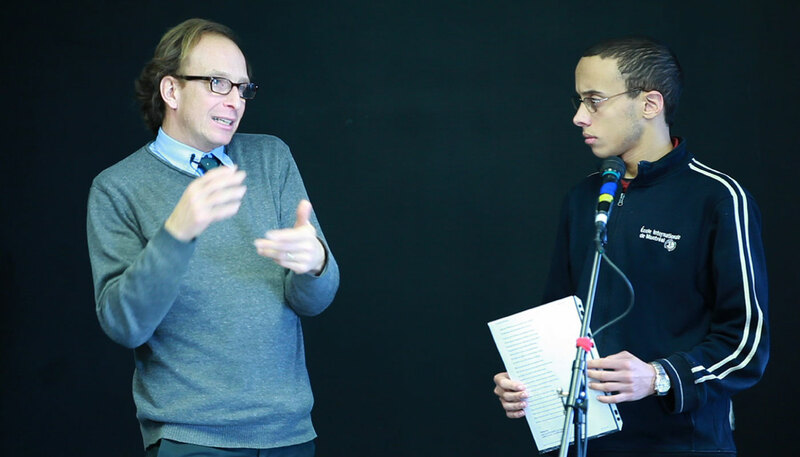 Through exploration, memorization, and performance, your students will have developed a personal relationship with poetry — and that’s invaluable. *We strongly recommend that any student who advances from a grade 9-12 classroom contest directly to the Senior Online Qualifiers be given the opportunity to recite both of their poems in front of a large audience, for example, at an assembly. Whenever possible, have these students recite using a microphone on a stand (a microphone will be used at the National Finals).